ACTS or Afzet Container Transport Systeem was a Dutch rail operator. Since 2011 its activities have been carried on under the name Husa since the Belgian company HUSA Capital BV aquired its majority stake. This locomotive is/was a Reeks HLD 62 machine. It was a Belgian locomotive type based on the famous Swedish GM/Nohab "roundnose", which was produced under American GM and Swedish Nohab licence in Belgium. This Reeks machine is a further development, which was used not only by the Belgian state railways, but also by the Luxemburg state railways CFL. 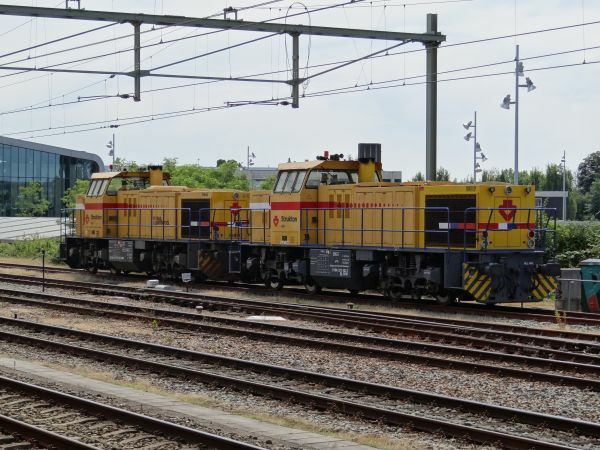 ACTS bought its machines used from the Belgian state railways NMBS. The type was built in 136 copies from 1961 onwards and it was taken out of use at Belgian railways in 2003. It was a dieselelectric machine weighing 81 tons and with a modest power rating of only 1030 kW and a top speed of 120 km/h. The engines were made by General Motors. Picture from Leeuwarden 16.7.2010 by Ilkka Siissalo. A Siemens EuroSprinter locomotive of the type Br189 used by ACTS/HUSA. The locomotive is owned by the locomotive leasing company MRCE Dispolok (formerly Siemens Dispolok) and it is in German register. Siemens calls this type ES64F4 (EuroSprinter 6400 kW freight version with 4 electric systems). The type is available in 11 different variants which can operate in 12 European countries, but each variant only in 1 to 7 countries. 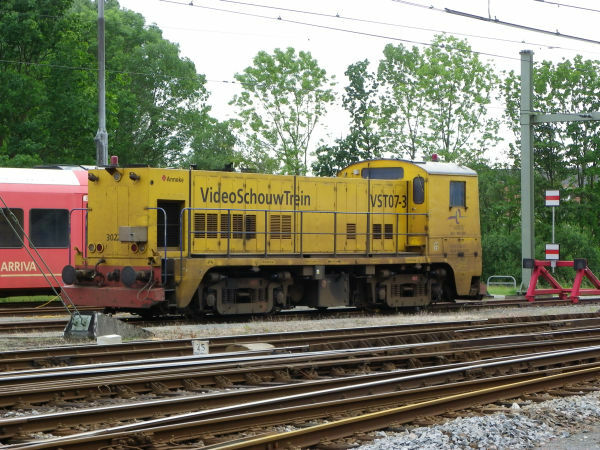 This one is of the variant "VK" which can run only in the Netherlands and Germany but it still covers both the DC electric systems of the Netherlands as well as the new 25 kV AC and the German 15 kV AC system. Picture from Amersfoort 3.10.2010 by Sanna Siissalo. This old blue and yellow class 1200 electric locomotive no. 1251 is still in the colours of ACTS, although in the meantime ACTS as a company is now defunct. These famous old locomotives were built 1951-53 by the companies Werkspoor and Heemaf copying a US design of Baldwin and Westinghouse. 25 locomotives were made. State railways NS gave up them in 1998 and five of them ended up at the company ACTS. Railexperts is now renting this old antique machine for charter rides. 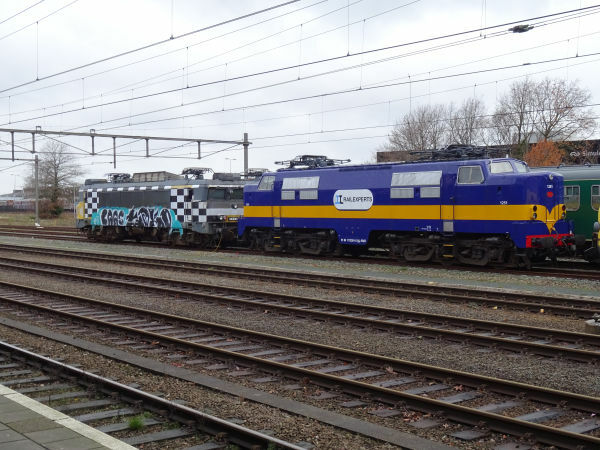 The locomotive on the left, no 1832, belongs to the NS class 1600, built based on a French design. Some class 1600 machines were renumbered in the 1800 series when they were moved to NS Reizigers, the passenger train division of NS. Lately NS Reizigers has had less and less demand for them as new TRAXX machines have become available and many have been sold. 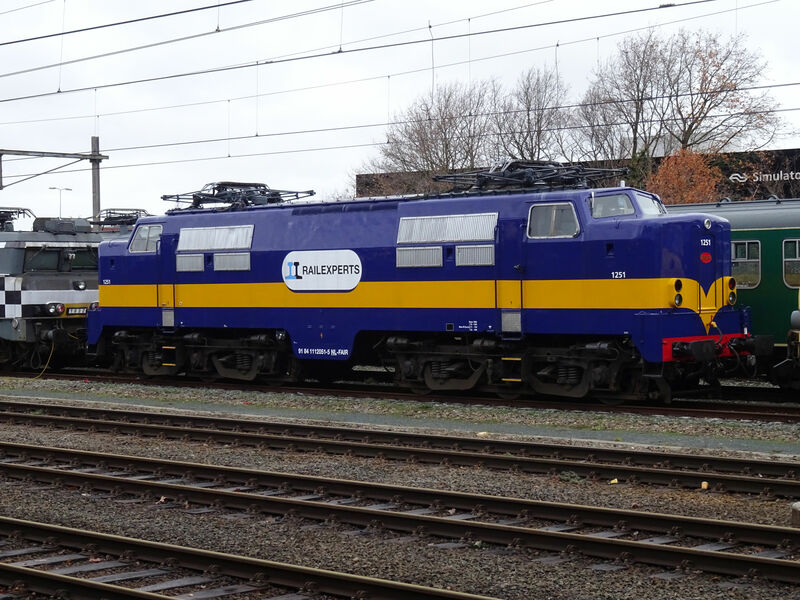 Originally this locomotive was named after the city of Nijmegen. 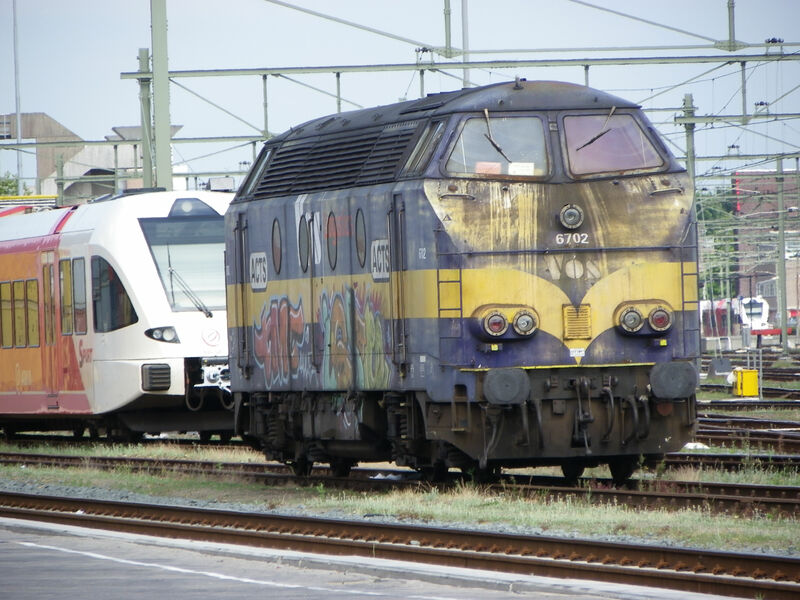 It was taken in use by the NS as 1632 Nijmegen in the year 1982 and was moved in 1999 to NS Reizigers. It was then transferred to NS Cargo, which became DB Railion. 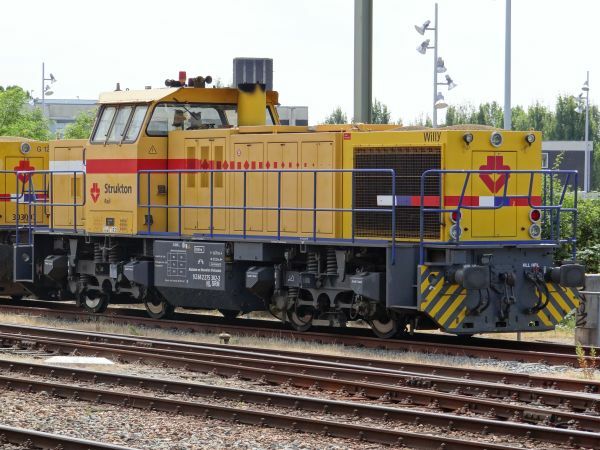 In 2002 the locomotive was sold back to NS Reizigers which in 2012 sold it to HSL Logistic. That is when it got its peculiar chessboard livery. It's a pity that it is so badly smeared with graffiti now. A closer look at the famous old class 1200 machine. The company Strukton specialises in track laying and other railroad track construction and repair works. These two Strukton's locomotives "Demi" and "Willy" are both of the Vossloh type G1206. 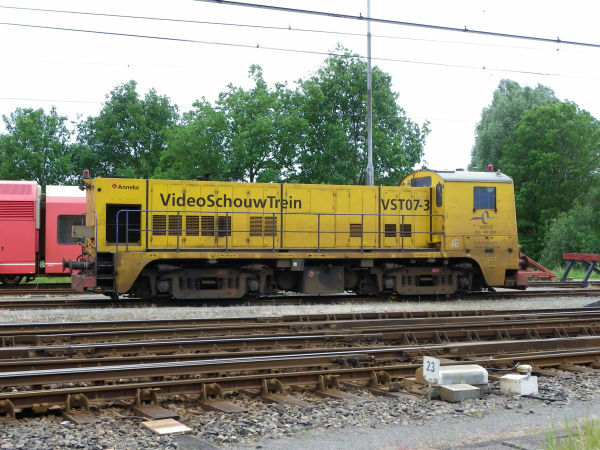 This VideoSchouwTrein VST07-3 is nowadays owned by Eurailscout. 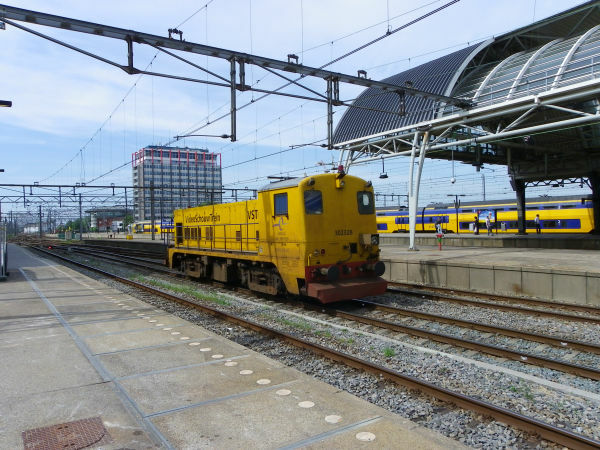 It is an old NS class 2200 diesel engine, former NS 2282, now known by the name "Anneke". Eurailscout has three similar video surveillance locomotives known as "Anneke", "Berta" and "José". The idea is to ride all the possible tracks while simultaneously taking a high resolution video of all of the track. That can reveal for example trees which might be in danger of falling onto the tracks or anomalies in track geometry. 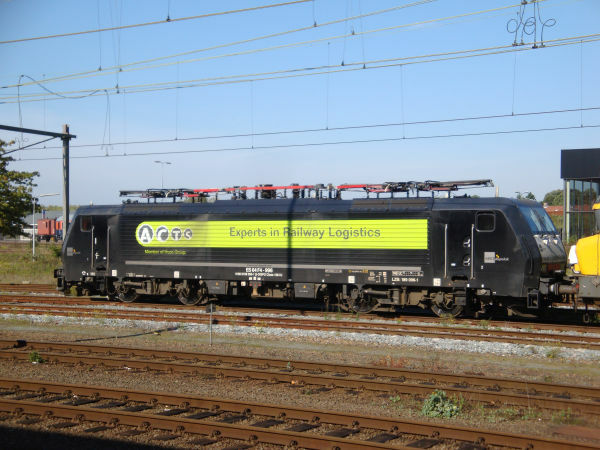 Picture of VST07-3 "Anneke" at Groningen 22.5.2011 by Ilkka Siissalo. Another view of the VST07-3 "Anneke". Note that Eurailscout is a part of the Strukton group. Similar, but not the same. 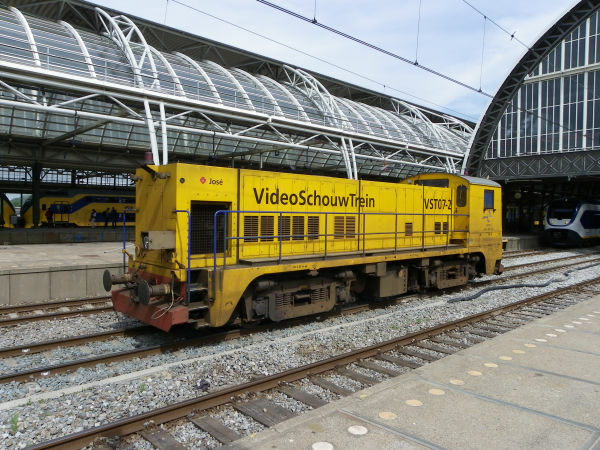 This is Eurailscout's VST07-2 called "José", here making a video film at Amsterdam Centraal. Picture from Amsterdam Centraal station 23.5.2011 by Ilkka Siissalo. Eurailscout's VST07-2 called "José" seen from the other side.